This January brought a stark reminder of the perils of European dependence on Russian natural gas. A cutoff of supplies connected in part to a pricing dispute between Russia and Ukraine, the crucial transit country for much of Russia’s gas, left millions of Europeans without heat and forced factories to close. The crisis not only underscored the challenges of managing U.S. and European relations with Russia, a country whose geopolitical reach rises and falls to some extent with the price of oil and gas. It also highlighted the difficulty for America’s European allies of breaking their dependence on a single energy supplier, one whose willingness and ability to provide sufficient gas over time is uncertain. This Council Special Report, authored by Jeffrey Mankoff, explores the challenges faced by consumer and supplier alike in Europe and Eurasia. It looks at Russia’s rise as an energy power, analyzing its control of supplies and delivery systems and its investments in energy infrastructure across Europe, as well as questions about the potential of its production. The report also examines Europe’s difficulties in forging a common policy on energy supply and recommends a two-pronged strategy of integration and diversification. It urges Europe to integrate both internally—developing a single EU gas market—and externally—tying Russia’s energy sector to Europe and its more transparent regulations. It also recommends that Europe seek new sources of energy from both non-Russian suppliers and non-fossil fuels. 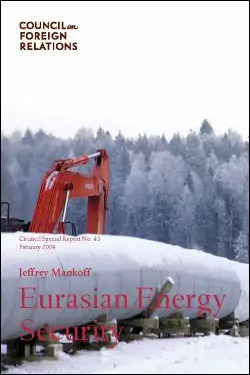 Eurasian Energy Security is a thoughtful work that illustrates the need for a coherent European energy policy and argues that the ongoing financial crisis provides a unique opportunity to tackle the issue. At the same time, it recognizes that European dependence on Russian energy will be a reality well into the future and that Europe can increase its energy security only by working with—not against—Russia. The report is a sophisticated contribution to the debate on an issue that can at any moment hit home for millions.